Bob Stewart has been entertaining for over 25 years and plays a variety of Scottish/Celtic and contemporary acoustic music. His performances are a very lively affair with a mixture of traditional and original material, a driving acoustic guitar sound, bodhran and mandolin (not all at the same time) and humour! Bob was born and bred in Alyth, Perthshire and has been a full time musician since 1989. 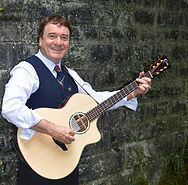 He has played in several successful bands, touring Scotland and Europe before going solo in 2007. In 2017, Bob returned to his roots and began performing again in the traditional music scene. Still living in Alyth and touring the length and breadth of the country, he is looking forward to one of his busiest years ever!